Monday night on October 22, Toronto’s elections came to a close and the new term will begin this December. 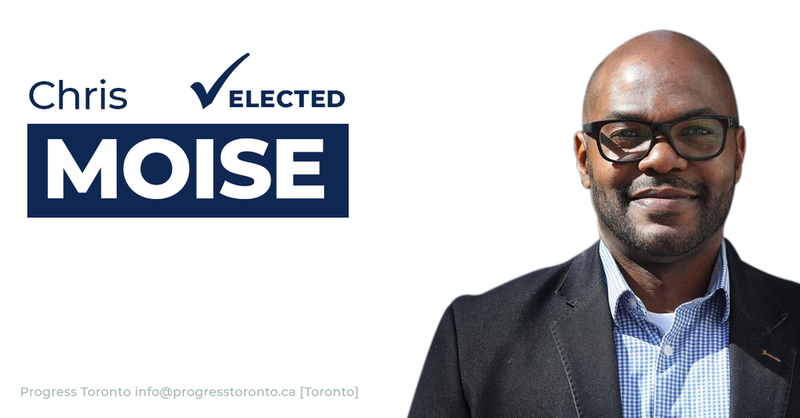 At Progress Toronto we are ready to get to work to win on key issues at council and the school board. Over the last few months of organizing to stop Ford and through our organizing in this election, we have built a lot that will power our organizing in the new term. This email is an overview of the last few months and highlights some of our wins in this election. When the election began in May, people across the city were full of excitement and hope for what this election would bring. With 47 wards, we had roughly a dozen open council seats — wards where there were no currently elected city councillors running for re-election. Many new candidates from historically underrepresented communities registered as candidates and we all imagined a very different city council. Then came June and with it the devastating Provincial election that elected Doug Ford as Premier with a majority government. Everything changed. After the city nominations were closed and just when we knew who was running, Doug Ford put forward his bill to gerrymander our electoral boundaries mid-election and slash council from 47 wards to 25 wards. Within hours we fought back. We rallied, won city council votes, and packed Queen’s Park. Tens of thousands signed petitions, emailed and called politicians, and when that wasn’t enough we appealed to the courts. In early September, the judge ruled and we won our court case! But within hours, Ford announced that he was appealing the judge’s decision and worse, that no matter the outcome in the courts, he would be overriding our Charter Rights using the notwithstanding clause — an unprecedented move for an Ontario premier. On September 19, just 4 weeks before Election Day, the appeals court put us back into a 25 ward election. Nominations re-opened and then closed on Friday September 21. It was only then that we knew who was running. Incredible candidates across the city withdrew their names. Others stayed in and rushed to raise twice the money and cover twice the ground in only 2.5 weeks before voting started and 4 weeks before Election Day. Not only did we find ourselves in the “incumbent hunger games” as one councillor called it, but in many races there were now progressive candidates running against each other — candidates who never intended to run in the same ward. With only a few weeks remaining, we stayed focussed on how we, in our first ever campaign and as a new third party organization, could make the difference. We took a deep look at races across the city, we surveyed candidates, and we reviewed voting and attendance records of incumbents. We narrowed our work down to organizing to elect 4 city council candidates in some of the toughest races, to defeat 5 of city council’s worst councillors running for re-election, and to elect 8 TDSB school board candidates. 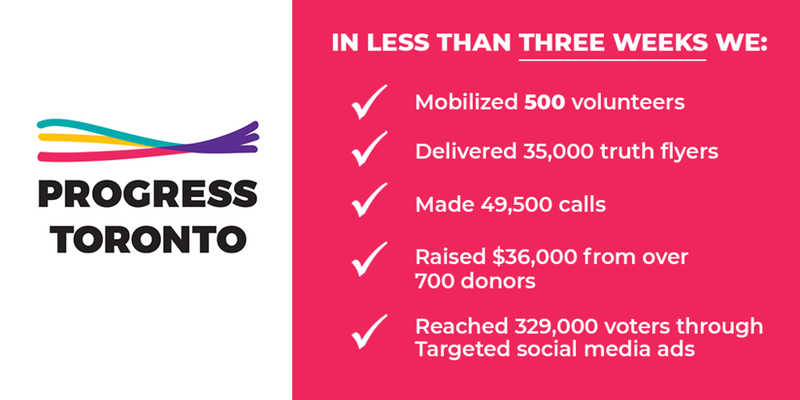 Then with only 3 weeks we worked hard to mobilize hundreds of volunteers, phone thousands of voters, and hand deliver over 35,000 flyers that set the record straight on some of Toronto’s worst councillors. We focussed on unseating five of the worst councillors: Giorgio Mammoliti, Frances Nunziata, Frank Di Giorgio, Christin Carmichael Greb, and Mark Grimes. We designed flyers that highlighted the councillors' voting records, attendance records, and reports from Toronto's Integrity Commissioner. Then we translated the flyers into the top languages in their wards. Thanks to hundreds of volunteers, we were able to hand deliver over 35,000 flyers to households in four wards. 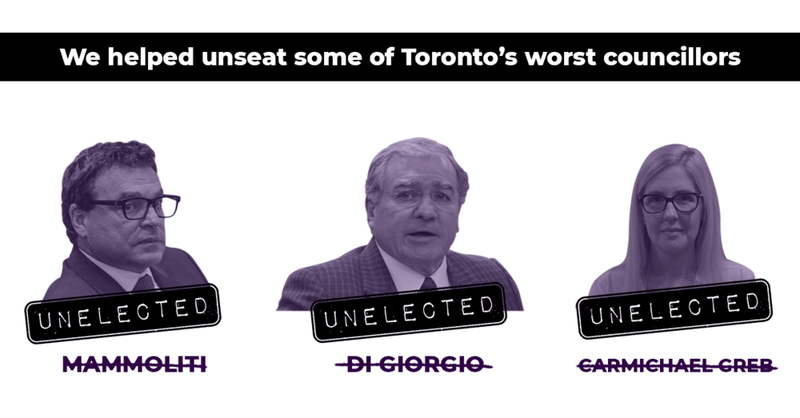 Christin Carmichael Greb, Frank Di Giorgio, and Giorgio Mammoliti were all unseated! Mark Grimes and Frances Nunziata were re-elected, but found themselves in much harder races and winning by a much smaller margin. We will continue our work in their wards in the new term. In Humber River-Black Creek, volunteers hand delivered over 15,000 flyers in three languages, that set the record straight on Giorgio Mammoliti — arguably the worst Toronto city councillor. On Monday night, Giorgio Mammoliti received less than 25% of the vote and was soundly defeated! Click the link below to share this win on Facebook. We helped elect three candidates! Some of the candidates we worked hard to elect did exceptionally well, but sadly were not elected this time. Some lost by just over one hundred votes and others posed serious challenges to long-time incumbents, but did not unseat them. Three incredible candidates were elected. Congratulations to Yalini Rajakulasingam, Stephanie Donaldson, and Chris Moise! Yalini grew up in Scarborough North and through her work as a trustee wants to help build a healthy relationship between schools and Scarborough North communities. She will stand up to cuts to education, advocate for the arts, diversity, student safety, student rights, and school funding. Click the button below to share Yalini's win on Facebook and congratulate her. Like or share on Facebook to say congrats to Yalini! Stephanie is committed to keeping our public schools open and maintained, with safe and equitable learning environments. She will be a strong advocate for public education and student rights in the face of Premier Ford. Click the button below to share Stephanie's win on Facebook and congratulate her. Like or share on Facebook to say congrats to Stephanie! This summer, Chris took Doug Ford to court as one of the appellants fighting Bill 5. As trustee he is committed to continue standing up to Doug Ford, to fight for a modern health curriculum that includes consent, online bullying, and gender diversity. Chris will fight for a safe, equitable, and progressive school system. Click the button below to share Chris' win on Facebook and congratulate him. Like or share on Facebook to say congrats to Chris! Much of the excitement for the election that so many of us felt in May was taken away when Ford slashed representation this summer. Many voters didn't know who was running or what ward they lived in and many candidates didn't have the chance to talk to the tens of thousands of new voters added to their wards with only a few weeks remaining in the election. This contributed to voter turnout plummeting. We went from 60% voter turnout in 2014 to only 41% in this election. We are left with a city council that is once again severely lacking representation from historically marginalized communities. It will be up to Progress Toronto, alongside other advocates and community groups, to help make sure city council understands the lived experiences of the majority of Torontonians. This was not the election we had all been planning for in May, but the silver lining is that we sent Giorgio Mammoliti, Christin Carmichael Greb, and Frank Di Giorgio packing. We are even more excited to have helped get Yalini Rajakulasingam, Stephanie Donaldson, and Chris Moise elected! We launched as a not-for-profit last April so that we could organize for a more democratic, socially just, and progressive city. Our goal is to organize to win key votes at city council and the TDSB. That's why this election mattered to our work. It was an opportunity to elect new progressive councillors and trustees to city council and the school board. Over the new term of city council we will continue to hold politicians accountable, making sure their constituents know their voting records and which lobbyists they are meeting with. We will also be organizing to win on key issues related to affordability, inequality, democratic access, public services, and more. You can see the top 30 issues for council and top 20 issues for the school board that we highlighted during the election by clicking here. We will be connecting people to democratic power through mobilization and engagement in decision making at Toronto city hall. That means running and supporting campaigns to put progressive solutions onto the city's agenda and organizing to win. Our political power and ability to create change doesn't end on election day. We can all still have a significant influence on the decisions being made at city hall and the TDSB. At Progress Toronto, we are ready to get to work, to build upon our work this summer, and organize to win in the new term. We are all very excited that you're a part of it! On behalf of our whole team — thank you!